To see a printable version of this page, click here. An ITT course will teach touch and body-work modalities, which will enhance health & wellness for animals, thus providing relaxation; it will also lead to stress reduction and performance enhancement. Equine Level I workshops are 6 full days for $1224; tuition includes The Equine Massage Workbook, anatomy charts & DVD. Equine Level II workshops are 5 full days for $1020; tuition includes The Horses' Muscles In Motion. Canine Level I workshops are 4 full days for $740; tuition includes The Canine Massage Workbook, anatomy charts and DVD. Canine Level II workshops are 4 full days for $740; tuition includes Dissection Of The Dog. Feline workshops for 2019 to be announced. 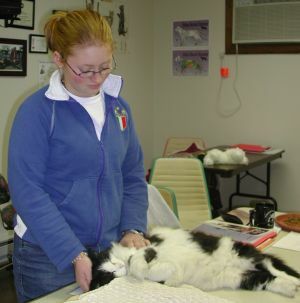 Feline workshops are 3 full days for $550; tuition includes The Feline Massage Workbook & anatomy charts. 25 CE/Contact hours. Massage experience is not a requirement for entry; however, both knowledge in massage and/or knowledge about the animal being studied are greatly beneficial. I build on the knowledge and experience you bring with you to the workshop. The classes at Integrated Touch Therapy are small, with a maximum of 8 students to 1 teacher; the ratio is usually 6 to 1. This ratio provides superior individual attention. The class is designed for those in the field of animal health, as well as massage therapists, looking to diversify their practices and those individuals who want to work with their animal friends at home. A deposit must be received with your registration to hold your reservation. Upon receipt of your deposit, we send a confirmation letter, accommodation list, a map, and materials specific to the workshop you have registered for. Bring your animal, if possible. Please make arrangements ahead of time with ITT. 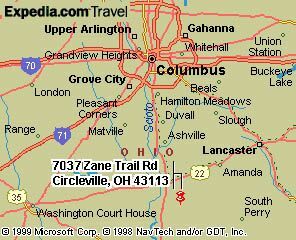 A health certificate is suggested if you are crossing state lines with your animal. Dogs need to have a crate if you plan to leave them in the classroom at lunchtime. 6 clean stalls are available for rent--2 with paddocks. There is also a 100' x 200' lighted sand riding arena for your convenience. The cost for your horse is $15.00 per day. You must bring your own feed/hay and we request a health certificate and a negative coggins. Synergy Farm is a delightful environment in which to spend a few days or a week. The pastoral setting with a pond is a pleasure to stroll during the breaks. The barn has a classroom built to accommodate the workshops, including restroom facilities. Equine Massage Introduction, Level I, teaches adapted Swedish and Sports Massage Techniques for the equine. The workshop is intensive, teaching a full-body relaxation massage choreography as well as pre- and post-event sports massage choreography. The massage techniques and theory of application behind them are taught. The muscle anatomy of the horse section covers muscles and the primary actions produced by these muscles. General equine wellness information, business and ethics, safety, as well as ideas on how to get started, are discussed. Students should bring colored pens or pencils, note pad, horse stories and photos. Prerequisite: Equine introduction or an equivalent equine massage course. We ask that you have completed 25-50 massages before coming to this class. 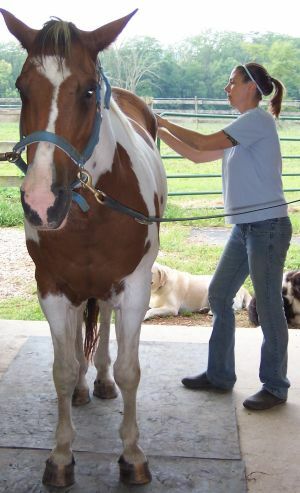 Equine 2 is based on the massage techniques learned in the first course. The curriculum covers adjunctive topics which affect the performance of the horse such as shoeing, dentistry, and saddle fit. A horse-wellness project will be developed by each student during the week. We suggest that you bring colored pens or pencils, clipboard, a notepad, measuring tape and your case studies as well as horse-friend photos. If you are a graduate of an equivalent equine massage course, a video of you performing a horse massage must be sent for review. For details call or email the office. Equine level II is based on the massage techniques learned in the 1st-level course. The curriculum covers adjunctive topics which affect the performance of the horse such as shoeing, dentistry, and saddle fit. Additional anatomy and physiology are covered, as well as case studies. A horse project will be developed by each student during the week. Students bring colored pens or pencils, clip board, a notepad and a measuring tape, case studies and horse-friend photos. Canine Massage, Level I introduction, teaches several massage techniques for relaxation and how to apply several of these techniques for a sports-massage application. The diversity of the canine anatomy, the application of adapted massage techniques and canine behavior and body language are part of the curriculum. Safety, ethics, and record keeping are discussed. Massage choreography will be developed during the workshop. Students should bring canine friends if possible, colored pens or pencils, notepad and dog stories and photos. More anatomy and physiology, additional massage techniques, business applications and choreography for relaxation, performance enhancement, and reduction of stress will be developed and discussed. We will begin to look at the gaits of the dog, paying particular attention to imbalances and what the dog might be showing us. Ethics, business practices, and networking discussions will be held as well. Students bring your canine companion if possible, a notebook, pens and more dog stories and photos. Feline massage introduction teaches feline massage, using general Swedish and sports-massage techniques. We cover anatomy and physiology of muscles, personality traits and body language, and the adaptations of massage technique. Students, please bring your feline companions, if possible, pens or colored pencils, a notepad and cat stories and photos.